"Pressure cooker or slow cooker! 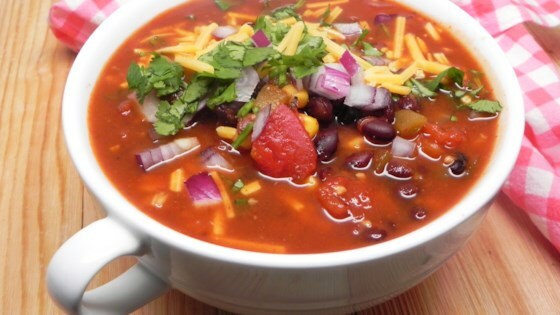 Super easy set-it-and-forget-it meal, with all the enchilada taste in a soup. Garnish with cilantro, avocado, red onion, shredded cheese, sour cream, and tortilla strips or chips." Combine chicken breasts, black beans, chicken stock, corn, tomatoes, enchilada sauce, green chiles, onion, garlic, salt, and cumin in a multi-functional pressure cooker. Close and lock the lid. Select Stew mode and cook on high pressure according to manufacturer's instructions; set timer for 30 minutes. Allow 10 to 15 minutes for pressure to build. Release pressure using the natural-release method according to manufacturer's instructions, 10 to 40 minutes. Remove chicken, shred it with 2 forks, and return it to the soup. If using a slow cooker, cook on Low for 6 hours or High for 3 hours. You can use 1 1/4 cup homemade sauce in place of the canned enchilada sauce. This soup is great! "Soup"er easy and "Soup"er Good!